Some really stunning and imaginative floral displays at Winchester Cathedral. Took a few pictures of my favorites. Very lucky to take part as a stall holder as part of the summer market that ran along side the flowers inside the Cathedral. 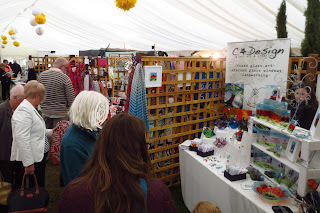 And heres some pictures of our stall and the fused glass art we have been selling over this last week. Winchester Flower Festival 2013 our stall in the summer marque market. CStar Design 'Meadows - Poppies' fused glass art, window art. We (lisa and me) had a fab time, thank you to every body who came to see us. Lovely event.